USA's Richard Dornbush performs to Elena by Brian Setzer at the 2010-11 Junior Grand Prix Final of Figure Skating. USA’s Richard Dornbush won the short program event over teammate Keegan Messing and China’s Han Yan. Dornbush, who skated last in the first flight, nailed all his elements and displayed excellent flow and sharp presentation skills in his routine to Elena by Brian Setzer. He earned a level four on all his spins as well as a level three on a straightline step sequence to post a new personal best of 70.75 points. The student of Tammy Gambill was the only one to score above 70 points. Since his last autumn Junior Grand Prix event in Dresden, the skater focused mainly on getting a triple Axel consisted enough to include into the short program – the task at which he obviously succeeded as he got mostly positive grades of execution for the element. “I also worked on my second mark, as well as levels for spins and steps. It is always work in progress,” he added. The 19-year-old hopes to draw on the experience he gained at the two previous Junior Grand Prix Finals to perform well tomorrow. Messing slightly outscored his teammate on program component scores and nearly earned a straight +2.00 for his impressive triple Axel with excellent running edge. However, he lost most of his technical advantage when his two spins were graded level one to receive 68.52 points in total – less than half a point away from his personal best. The Junior Grand Prix Final debutant delivered an outstanding routine to music from the Robin Hood soundtrack. He maintained the character throughout the entire program with numerous touches during step sequences and in-between moves carrying the theme of the famous sharpshooter. For the long program, however, he plan to take a conservative route. Unlike the majority of compatriots, who have mostly been known for their arsenal of jumps, China’s Han Yan’s strongest skill is his presentation. The debutant of the Finals posted a well deserved highest program component score of the night for a highly entertaining and swingy routine to Time Club. However, his lack of a triple Axel did not allow him to place higher than third in the strong field. Even though he earned impressive grades of execution on all his element, including spins, he only received a total of 67.29. While it’s a new personal best, it puts him three points below the leader. Training mates Joshua Farris and Max Aaron (USA) made identical mistakes in their short programs. The students of Tom Zakrajsek stumbled on the landing of their triple loops out of steps. Both, however, nailed their triple Axels. Even though Aaron did a better Axel triple Lutz – triple toe loop combination, Farris ended up being (65.24 vs. 63.78) thanks to higher levels of difficulty on his spins. The last skater to receive a mark above 60 points was Russia’s Zhan Bush (60.05). The student of Alexei Urmanov fought for the landing of his opening triple Axel and later stumbled on the landing of the second jump in combination. 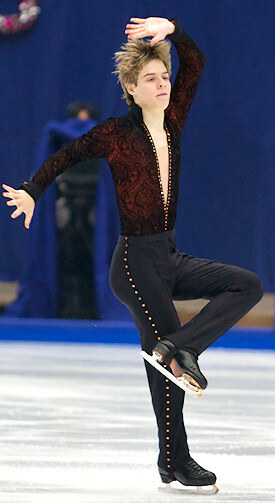 Andrei Rogozine of Canada, the highest ranked skater after the qualifying events, was last to skate. The finalist had troubles with the landing of all his jumping passes, and his triple toe loop in combination with a triple flip was counted as underrotated. He also only earned a level one for his combination spin. With 59.17 points it will be difficult for him to pull up to the podium. Even though considering the overall quality of his skating, he fully deserves to be among the contenders for the title. Russia’s Gordei Gorshkov fell out of an underrotated triple Axel and finished last with 55.55 points.